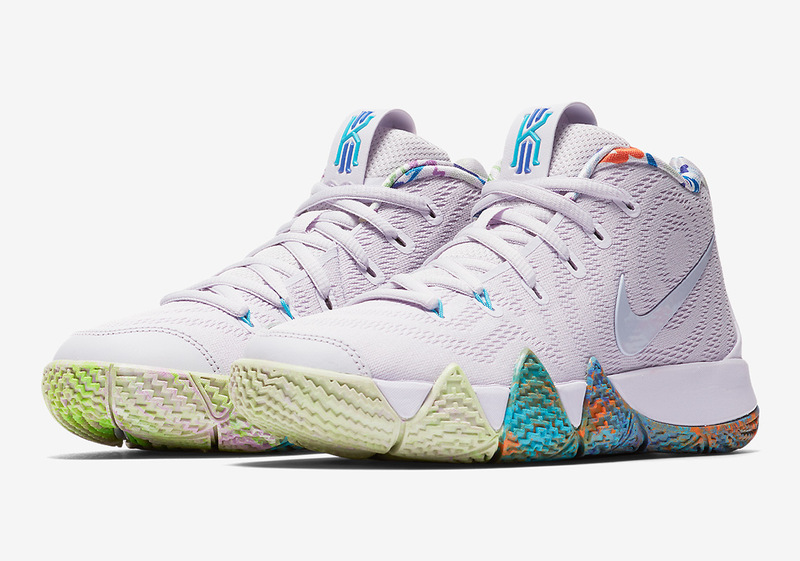 While most of the attention surrounding the Nike Kyrie 4 line has been focussed on the upcoming “Cereal Pack”, the Swoosh still has plans to keep consumers interested in other intriguing GR options. Next up is a whimsically colorful selection inspired by the 1990s that is set to release next month in sizing for both adults and kids. With designs and color palettes from a simpler time in mind, Nike adds a vibrant confetti pattern onto its instep as well as a multi-color tie-die-like outsole with orange, yellow, green, purple, and more. A metallic silver midfoot Swoosh and a stark white upper are present for contrast, creating a nostalgic aesthetic that will remind consumers of the era the shoe is named after. Peep an official look at the newest Kyrie 4 below and look for it at Nike Hoops retailers on August 25th.